"I'm NOT Joan Crawford" protested a local author friend of mine when confronted with an unpleasant but publicity-garnering photo-shoot. I am, however. The more publicity the merrier: "It's when they STOP asking that I'll mind..." I like to acquire fans and sell books. So, here, shamelessly presented word for word, for your delectation, is a recent review from The Los Angeles Times (the title links back to the original). The new book is ay least 30% longer than the old one, re-organized, and easier to use. There are more than 36,000 restaurants in Mexico City -- and that’s the licensed ones. The only problem with such an abundance of riches is that finding your way through it can seem an impossible task. 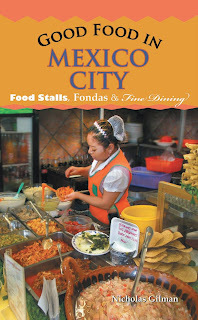 Fortunately, Nicholas Gilman’s newly revised and updated “Good Food in Mexico City” is there to be your guide. Gilman, an occasional Los Angeles Times Food section contributor, has lived in Mexico City since the 1990s and was visiting on a regular basis even before that. His book covers an impressive range of restaurants, from fine-dining to lowly food stalls, in areas both well-traveled and known only to locals. The book tells you which of the experimental nueva cocina places are really worth trying and which cantinas serve the best botanas. There's also an accompanying website that will keep track of updates. And where else would you learn about a place such as La Oveja Negra, which specializes in barbacoa cooked with sheep raised on the owner’s own ranch?